As Van Buren’s turn-of-the-century Main Street has been so wonderfully revived, it is also appropriate to remember this town’s biggest star who happened to live his early life right on these very brick streets. Bob Burns became famous during the 1930’s and ’40’s as the strapping, ruddy-faced comedian who had radio audiences from coast-to-coast bellylaughing at fanciful yarns about his kinfolk and old pals back in Arkansas. 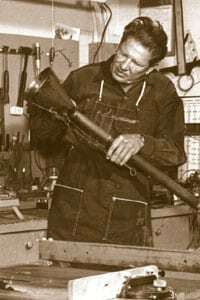 But Burns is probably best remembered for the unique, homemade musical instrument he invented and dubbed the “Bazooka.” In fact, because the strange horn was so well known, WWII combat soldiers nicknamed the Army’s new shoulder-held rocket launcher the “bazooka,” because of its blunderbuss appearance — just like Burns’ popular horn. Burns, whose given name was Robin Burn, was born in 1890 in nearby Greenwood, Arkansas. When Bob was three the Burn family moved to Van Buren, where they lived in a modest, two-story home that still stands today. Musically inclined, young Burns was playing trombone and cornet in Van Buren’s Queen City Silver Cornet Band before the age of 12 and, by 13, had formed his own string band. During practice one night in the back of Hayman’s Plumbing Shop, Burns picked up a length of gas pipe and blew into it, making a sound something like a “wounded moose. Burns didn’t know it yet, but he had just changed his life. Burns named his invention the “bazooka” (from “bazoo” meaning a windy fellow). Practicing constantly, Burns became good enough to play it in the Silver Cornet Band. Although many others tried, including some of the world’s greatest musicians, he was the only one who could play it. With little luck as an extra, Burns undertook a type of show business he hadn’t tried before. He auditioned with one of Los Angeles’ largest radio stations. After preparing 10 minutes of material for the audition, Burns was told he had 30 minutes to fill. When it was over, the managers told him they hated the first 10 minutes but loved the rest — the stories and chatter that Bob had desperately ad-libbed in between tunes on his bazooka. He became “Soda Pop” on an afternoon radio show called The Fun Factory, and Burns’ non-paying Soda Pop character quickly became popular throughout the West Coast area. Once in New York, Burns phoned radio impresario Paul Whiteman. With his heart in his throat Burns asked for an audition and got it! That night in 1935, on Whiteman’s coast-to-coast program, Burns quickly became a national sensation. Soon he was appearing as a regular guest star on Rudy Vallee’s extremely popular radio program as well. 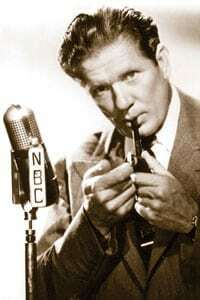 The hit radio comic returned to Los Angeles within a year and joined popular crooner Bing Crosby on NBC’s Kraft Music Hall radio show, where he remained until 1941. Movie offers followed and it wasn’t long before Burns got a part in his first full- length picture (Rhythm on the Range, made in 1936, co-starring Bing Crosby — also in his first major movie role — and a young bit player named Martha Raye). Burns and the big-mouthed comedienne were to become a popular acting duo.